Yes, you read that right, we’re mythbusting about poop today. We’re joining Sugar, the Golden Retriever’s Scoop that Poop blog hop – a hop dedicated to raising awareness on the importance of scooping your dog’s poop. 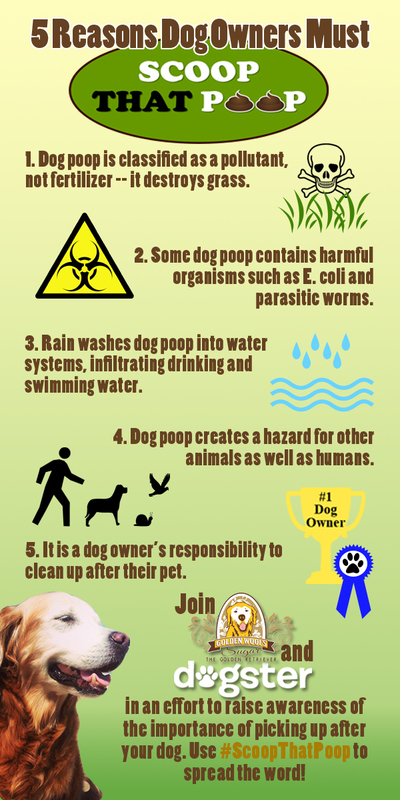 Along with Dogster.com they’ve created a great InfoGraphic that describes all of the harmful things that happen when people leave the poop and don’t clean up after their pets. Truth be told, the dogs would probably prefer that you leave the poop behind – it’s like a newspaper to them – telling them all about who’s come by, where they had dinner last night, etc. But we get it, it’s no myth that it can be harmful to us and to your dogs, so please scoop away. I’m going to bust the myth about why dogs like to eat poop so much. Yes, they do, you may not want to admit that your dog eats poop, but they all do it. It might be their own, it might be another dogs, or they might be connoisseurs of rabbit, cow, horse, coyote or even bear poop. I know you’ve experienced it first hand…but why, why do they enjoy those little morsels so much – especially why do they eat their own poop? They are trying to hide themselves from predators or misbehavior from the owner. They are confined and are hungry. They are lacking something in their diet. The reality is the answer is #5. Depending on the dog and their life situation and environment the reason they eat their stool could be anyone of those answers, or even a combination. I’ve only had two dogs with the habit – my first Lab, Maxine who I think fit in #4 group. A dog’s pancreas secretes enzymes to help them digest their food. Some dogs don’t secrete enough, so they look to supplement this deficiency with other animals feces – typically rich in these enzymes. When I altered Maxine’s diet to a higher quality food, the behavior diminished. Maggie also eats poop – not often, but I think she does it as a lingering habit of #3. She was a breeder dog in a puppy mill and so was confined all of the time. I know she struggled to get a place at the table during mealtime (as evidenced by bite marks on her head) so I think she does it because she used to eat other dog’s poop for subsistence. It’s also true that dogs may do it to hide themselves, or the evidence of misbehavior. Two of my dogs (Jack & Tino) back up into a bush in order to poop. They appear to be trying to hide it within the leaves of the plant. A dog who is punished for accidents in the house, may eat it to get rid of the evidence. Remember, if you Scoop that Poop, there won’t be any there to eat – so take care of it! That is so true, your multiple choice question! Thanks for sharing your resources. Ruckus the Eskie recently posted…Who’s your Water Buddy? Anytime Ruckus – thanks for stopping by! It is a good word isn’t. I have mastered pronouncing it yet…or spelling it either for that matter. Tynan was and Huxley is a backing up into the bush to poop dogs. Fortunately, their need to hide their poop didn’t go into the eating it extreme. Cat poop is a whole different story though…! Thank you for this myth buster. I have read some very disturbing stories about the lengths people have gone through to stop this behavior in their dogs and I have always wondered why they don’t just clean it up quickly, as you suggested! That’s the easiest solution! It works with Maggie and she does it less and less now too. Love the explanation! Dina would fit in four when she used to do it. Yup. Daisy and Jasper eat poop too. I am sure it is from their upbringing as younger dogs. I also pick up poop right away. Jasper knows that I will call him away if I see him heading for Daisy’s poop and will watch for me. Daisy will drop it if I catch her picking it up. I hate that they do it, but it is manageable if you pick up the poop right away. MelF recently posted…What is a dog threshold and why does it matter? Oh dear – Maxine used to love the popsicles too and it’s so much harder to clean up in the winter! I never knew about “coprophagia ” thank you for sharing! Caren Gittleman recently posted…#ScoopThatPoop you don’t want me biting ya do ya? I enjoyed grabbing a snack out of the litter box, but since it is clumping litter and Mom did not like me snacking there in the first place, that snack source was removed from my reach. Katie and I do enjoy a nice rabbit pellet or two or three sometimes but otherwise, we aren’t into eating poop which makes for a much happier Mom. Rabbit poop I can deal with…doesn’t bother me too much, its the horse & coyote poop that really get to me…and cleaning it up isn’t really an option. I agree – they do think it tastes good. Jack’s favorite is coyote poop. Sheba’s never ate her own poop, when she was a pup she liked the contents of the cat’s litter box though, great post. Sheba’s Life Story recently posted…Scoop the Poop Campaign and blog hop. #ScoopThatPoop. Cat poop does seem to be a favorite among our readers, so Sheba is in good company. Our dogs don’t eat poop and I’m thankful for that, but I know that it’s a condition and something to look out for in our future dogs. What our dogs will do, if allowed, is snack on the litter box, so it’s upstairs with a cover and the dogs don’t go near it (thank goodness). Its funny what attracts them. Sally loved rabbit poop and could dine for hours on it if I let her. Jack & Maggie – only a passing interest. Maybe it’s an acquired taste. You and I have had this conversation before about Callie’s poop-eating habits. And I think I decided at the time that since Callie would leave her poop alone if she didn’t see me cleaning it up, she must have placed higher value on it when she did see me cleaning up. But, since I switched them over to the Fresh Pet Roasted Selects, she has stopped eating the poop. I really believe now that it was the increasingly lower quality of the kibble I was feeding them that caused Callie — and Shadow on occasion — to try to get the nutrients she was missing out on. Not only is she walking away from it now, but it is now healthier-looking than it ever was (and doesn’t stink to high heaven either, even on a hot, humid day)! Great news – I’m glad Callie has abandoned her old habits…and that she’s healthier for it! Hmmm, I don’t eat dog poop at all…but bunny chocolates, well that is a whole other story (they are delicious)! You are right, if everyone would scoop their poop dogs wouldn’t have the opportunity to eat another’s poop. This is especially important as other dogs’ poops can spread contaminants (germs and disease). Great post, SlimDoggy and thank you for joining in the hop! Bunny chocolates used to be a delicacy here, but Jack and Maggie don’t seem to like them too much…which is FINE by me. It’s so important to clear up after your dog, both your yourself and others! We read that a vet can prescribe drops that make the poop smell so bad they wouldn’t want to eat it. But we can’t even imagine what that smell would be like. jan recently posted…Do dogs feel guilt? I know…it’s bad enough now. It’s pretty common to pick up parasites from poop – Sally used to get it from the rabbit poop – had to have her checked pretty regular. Fascinating post today SlimDoggy…I’ve never had a dog that ate dog poop, but cleaning out the cat box is a whole different story…Gizmo likes to go to the farthest corner to poop which I find interesting…he leaves the scent far from home to ??? dissuade predators??? Have you ever noticed that a car ride will get a dog to poop? No matter how much he poops before we leave home, as soon as we get out of the car he needs to poop again…so I always have an extra couple of bags in my pocket or purse…Thanks for joining the hop! I’ve never had a dog that had to poop after a car ride – that’s a new one. Man, I’m glad I’ve never had a dog do this. I think my husband would toss his cookies if our dog did that! Mom hasn’t figured out why I like to eat poop so much, so she just uses the scoop immediately strategy. Changing me to a higher-quality food hasn’t helped – it’s made my poop even more yummy! Great myth buster! I’ve never seen Sherman or Leroy eat other dogs poop, but my Beagle ate the Newfs poop all the time! They ate different food so I assumed he liked the taste of it! This was a excellent post for scoop that poop day. Bravo loved it! Easy reading post that is informative and fun at the same time 🙂 I’m one of those that are thankful that the dog only sniffs at poop and doesn’t eat it. I heard my aunt had a dog run away once and when they finally found him, he had developed a habit of eating poop. Life outside sure is tough for a lost dog. Yep – sometimes it’s all there is for them to eat, so it’s understandable. Thanks SlimDoggy! Great post and the memes are awesome! I think Lucky eats poop for similar reasons as Maggie. When she was in the shelter she was bullied out of eating the food. I think her only recourse was to eat the poop in the kennel. A couple of trainers that I work with have also talked about poop eating (or eating off the ground) as a compulsion that arises from anxiety. Might be interesting to look into for your post about dogs eating other dogs’ poop. I think dogs have the ability to develop weird phobias and habits…just like humans.